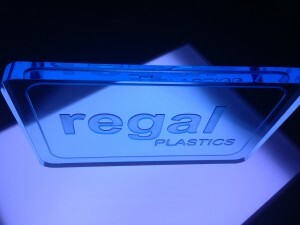 Acrylic sheets can be used to make a variety of stunning projects for both home and business. The sheets are often cut with a circular saw, which leaves visible lines. We often get asked by customers how they can polish the edges at home to create a clean, professional finish. Here are a few easy steps to get you started. This method is just as the name implies. You are moving a flame across the edge of the plastic. We recommend using a MAPP Gas torch. It can be purchased at most local hardware stores. Before starting, make sure that you have all the necessary safety precautions in place. Anytime you are working with fire, have a working fire extinguisher nearby and ready to use. To use this method, hold the flame two inches from the edge and steadily move across it. Practice on scrap pieces until you get the right speed. If you move too fast, the edge will not polish, and if you move too slowly, the acrylic can actually bubble or catch fire. Use a router or jointer to clean up the edges. Then, repeat the flame polishing method described above. For edges that are too thick to use a router, use an orbital sander. As with wood, work from a coarser to finer grain sand paper. Keep the sander moving in order to avoid heat build up. After sanding, you can either flame polish or use a buffing wheel to finish. However, once you start using a buffing wheel, you can not go back and flame polish. *TIP* Do not polish the edges if you plan on gluing them. Gluing polished edges can cause crazing thus ruining the acrylic. As always, ask a professional if you have any questions before starting. Would you like more information on flame polishing acrylic? Check out this tutorial, Flame Polishing Acrylic.